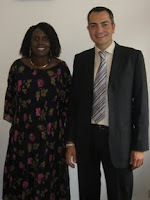 Earlier in May I met with Malian Ambassador for Germany Madame Fatoumata Siré Diakité in Berlin. Objective was to seek her support for the German information and fundraising activities of the Mali Initiative (MI). Together with other committed people in Munich and Berlin I have founded the MI's carrier organization 'Sterntaler für Afrika e.V.'. It's inspired by brothers Grimm fairy tale Sterntaler, in English The Star Money. The meeting with her "excellence" went very well, thankfully she looked over my faux pas when not addressing her with "excellence" as the diplomatic protocol would require. Fortunately, she is down to earth and hands on. She herself has founded a Kindergarten in Kalabancoro, the same are where the Mali Initiative runs a school and a street kid education program. „I fully support the Mali Initiative's work of improving access to quality education in Mali. Let the Mali Initiative be a bridge between the people of Germany and Mali. I join you in your dream of bringing a modern University of Timbuktu to life”. The best is that Madame Diakité will fly in from Berlin to give the key-note speech at our photo and information event on 1st July in Munich! So if you are in Munich or know someone there, join in!